Someday, the grackles will rule the world. They have already taken over numerous parking lots, happy to congegate near grocery stores and fast food places. Really anywhere there is trash for food and power lines and/or trees on which to perch. I noticed them almost immediately when we moved to central Texas, both visually for their sheer numbers, and audibly for their deafening screeching and cackling. I’ve never witnessed them attacking anything but my eardrums, but their sheer numbers make it easy to understand why grackles could cause problems. The photo with this post was taken today near a grocery store. The video, also embedded below, was taken a year ago in the parking lot of a big box store. Just listen to how loud they are! Then imagine if you lived near where they congregated. Wouldn’t the noise drive you insane? Like I said, one day, the grackles will rule the world. And we’ll all wish we were deaf! 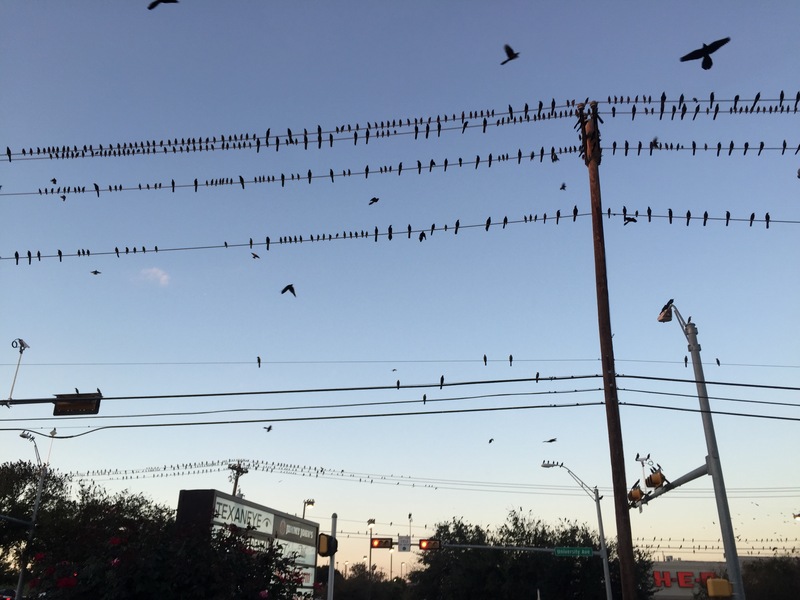 This entry was posted in Uncategorized and tagged birds, grackles on November 20, 2015 by Julie Riebe. It is amazing to watch murmurations of blackbirds, though there are only a few places in Texas you can witness this firsthand. You will LOVE this video of starlings shot in UK. Okay. That link was a bogus copy and paste. Try this one instead! They do look like musical notes!